Harvard scholar expounds on importance of language at Indian Embassy. WASHINGTON, DC: Renowned literary scholar Sharmila Sen, who is currently the Executive Editor-at-Large for the Harvard University Press, gave a talk at the Indian Embassy in Washington, DC, on Monday evening, during which she delved into the complicated history of the English language’s relationship with India and its various dialects. In other words, English has had a relatively short history in India – as Sen puts it, the history of English in the country more or less started in 1835, with Thomas Babington Macaulay’s famous “A Minute on Indian Education” speech on the floor of the British Parliament – so in order to truly understand as many facets of the country’s history as possible, knowledge of the subtleties of India’s languages is not only critical, but necessary. That may seem like an obvious thing to say, but many who study Indian history come at it like Macaulay — from an English point-of-view. To really analyze Indian history is to understand its pre-modern texts, which requires an inside-out knowledge of the country’s intricate linguistic heritage. Sen spoke about the role of English within India today, saying that while many see the introduction of English into India as an imperialistic act done by the British and something that therefore should be scorned (the various mixed perceptions of Macaulay in modern India were also touched upon by Sen), many in India understand that it is imperative to learn English in order to be competitive in the workforce, move up in social class, and also as a bridge language between various Indian dialects. In fact, English has become so indispensable in India that it’s difficult to imagine the country functioning without it, she said. In less than 200 years, English has gone from a novel concept for Indians to the country’s national language, along with Hindi. Throughout her sprawling, roughly 45 minute talk, Sen also lectured on the difficulties of being an editor at an institution where everyone wants to get published, how tricky it is to publish translated texts in English because of the work and money required to do so, and the struggle for identity faced by Indian authors who write in English as they try to maintain their “Indian-ness” while also writing for English audiences. Also at the event was Dr. Douglas Frame, Professor Emeritus and the chair of the Center for Hellenic Studies (CHS) at Harvard University, who introduced Sen before she spoke. Sen was born in Calcutta and spent part of her youth there before immigrating to the US, specifically Cambridge, Massachusetts. She earned her bachelor’s degree from Harvard University, and her Ph.D. from Yale University in English literature. She subsequently taught literature at Harvard University for seven years, specializing in texts from regions of south Asia, Africa, and the Caribbean. 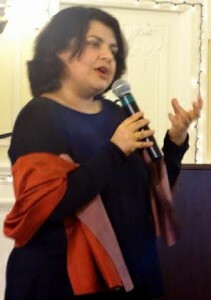 In 2006, she was appointed to be an acquisitions editor at Harvard University Press, after which point she came into her current position as the Editor-at-Large. During her time as an editor for the Harvard University Press, Sen has collected books on religion, classic works, and south Asia in general, among other academic areas, from scholars around the globe. In addition to her work as the Editor-at-Large, she also oversees the Dumbarton Oaks Medieval Library, and is at the head of the upcoming digital Loeb Classical Library and Murty Classical Library of India projects.